The European Parliament annually awards the Sakharov prize to individuals who have made an exceptional contribution to the fight for human rights around the world. 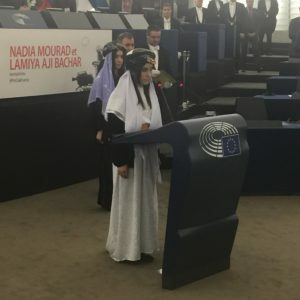 I was inspired and saddened to hear Yazidis Nadia Murad and Lamiya Ajj Bashar tell the European Parliament about escaping sexual enslavement. They have become spokespersons for women afflicted by IS’s campaign of sexual violence. They are public advocates for the Yazidi community in Iraq, a religious minority that has been the subject of a genocidal campaign by IS militants. You can read more about the Sakharov Prize and these women’s stories here.